Motivation: Is a good deed really a good deed? While we don't always get to learn a person's motives in his own words, this time we do. The words of William Boyd, Chief Baker's great grandfather, were recorded by his daughter and shared in an Indian Pioneer Paper interview. In this post, we will dissect that interview to learn why Boyd moved into the Cherokee Nation and what motivated him to advocate for changes in the Cherokee Nation. 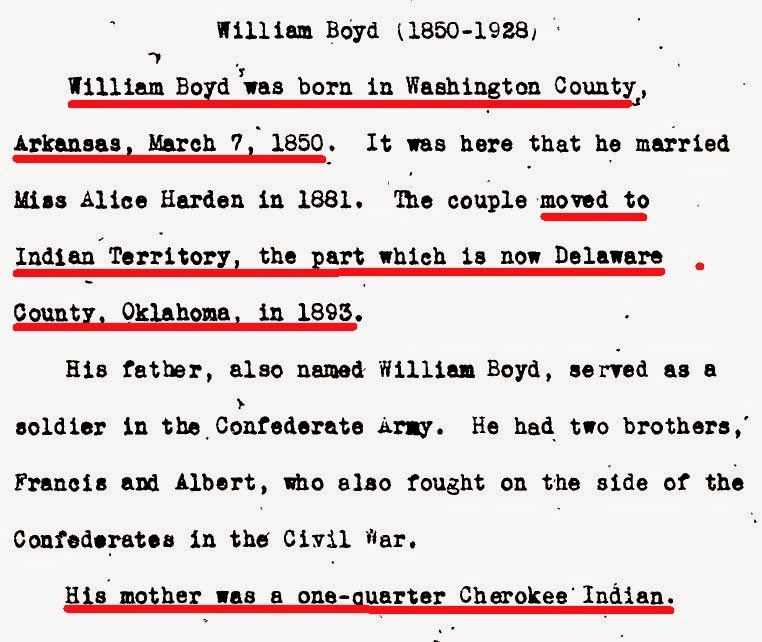 William Boyd, Chief Baker's great grandpa, was born in Arkansas, not the Cherokee Nation. He moved to Indian Territory in 1893, just before the family started trying to gain citizenship into the Cherokee Nation. His family had lived in Arkansas for 64 years and never moved across the state line into the Cherokee Nation. They always lived as white people. Nothing in any record shows any indication of Indian ancestry or that they considered themselves Indian. As soon as they crossed the state line from Arkansas into Indian Territory they started claiming to have Cherokee ancestry and they haven't given up the claim since. Notice Boyd didn't even say he was Cherokee or Indian. Instead, he said his mother was. It's a peculiar way to say something when one believes they are entitled to rights as an Indian, isn't it? Boyd's first task after arriving in Indian Territory was to make friends with the full blood Cherokees he refers to as "these natives." He said he made friends with them by treating them as his neighbors. Whether Boyd realized it or not, his comments not only indicate he was white, they also had negative undertones. His words suggest he thought he was better than the Indians, but he treated them as his equal in order to gain their friendship. It's important to understand what "claim" meant to U.S. citizens in the 1800s. They would settle on a piece of land they had no legal title to and "claim" it. This appears to be the type of claim Boyd was referring to because he didn't establish a claim to citizenship in the Cherokee Nation. He was repeatedly rejected and never gained the right to live legally on Cherokee land. Of course, that didn't stop him from illegally squatting there and using Cherokee Nation assets (land) to benefit himself and his family. He readily confessed that in 10 years time, he had cleared and cultivated about 40 acres of (Indian) land. 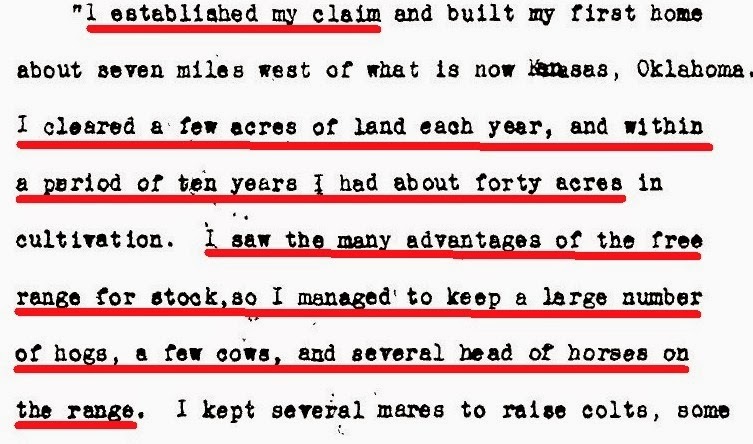 He also admitted he used a lot of (Indian) land for his livestock, taking advantage of the free range available. 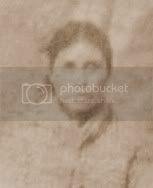 According to Nancy Hope Sober in the book, "The Intruders: The Illegal Residents of the Cherokee Nation 1866-1907", white citizens of the U.S. who falsely claimed to have an ancestor of Cherokee blood entered the nation presumably under the pretense it gave them the right to be there. Sober also wrote, "It was a common belief among intruding whites that "residence alone [would] give them a title to land in the Nation in the event it became a United States territory." "
We know Boyd falsely claimed to have an ancestor of Cherokee blood and that he squatted on Cherokee land, making his "claim." In my humble opinion, his actions were the same as many others who illegally moved into Indian Territory - it was an attempt at a land grab. He didn't move there to help anyone other than himself and his family. Does it get any more clear than that? "As there were few whites in the neighborhood" the white teachers usually boarded at HIS house. Why? Because Boyd was white too! This is where it is important to pay close attention to what William Boyd said. His motivation for his family doing "good deeds" starts to be revealed. He said the Indians did not want to change from their ways of living to that of the white man, but his greatest ambition was to do all he could do to bring about that change. Clearly he didn't care about what the Indians wanted. His greatest ambition was to change things to the way HE wanted. And what was his motivation for wanting things to change? I don't think an explanation is needed but in the event someone missed it, William Boyd's greatest ambition was to see that the conditions in the Cherokee Nation changed from the Indian ways to the ways of the white man because he lived there with his children and it was, apparently, in his opinion, a place so abominable that it was a sin to raise those children there. If that doesn't scream that he thought Indians were "savages" or "heathens", I don't know what does! Does anyone still believe this family was Indian? If you do, then either you are thick headed or living in a fantasy world. William Boyd's words expose him as a white man who thought he was better than Indians. Any good deed he did was clearly motivated by his desire to have a less "sinful" environment for his children. Since this series began, it's received both positive and negative reactions. 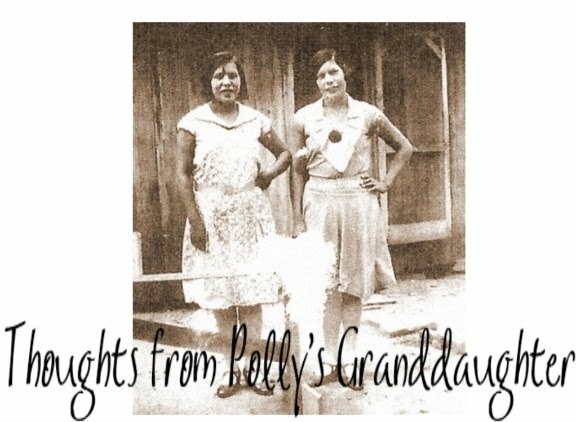 One of the most common negative responses comes from Cherokees who claim Chief Baker's maternal ancestors have done much work to improve the Cherokee Nation, therefore they should be given a pass on their false claim. While I disagree with anyone getting a pass on a false claim, let's stay focused on the "deeds". At face value, those "good deeds" might seem like a positive thing, but on closer examination, when the true motivation is revealed, one might begin to question whether those "good deeds" were truly good deeds. Again this is very interesting, I have not lived in the nation myself, so to be honest I don't know what has been done to help the Cherokee Indians! In saying this, I wish they would take more effort in helping UKB getting them on there feet opening more casinos! More jobs would be offered more money flow! It's seems the CN is only worried about Cherokee nation! Making themselves more important then offering some guidence to the UKB!!! Support UKB!! I'm CNO but I need nothing from the CNO! How ever UKB is in need where is there help? Another thing! Twila I love the blogs because we wouldn't even know who was real or who is just living a white lie!! It seems know one really understands this is not about who is more cherokee then who it's about are they cherokee and did they get away with this lie that they have been carrying around for centuries! I myself find nothing insulting just facts! Thank you! Can't wait for the next one! Have a great day!! He did think like a white man, he did use the bounty of this land for his own benefit. It's amazing to look back into the thoughts of an individual who decided to take what he wanted. Little has changed.